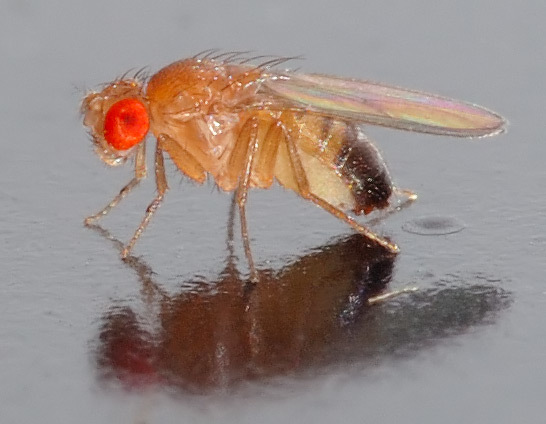 Small male Drosophila melanogaster fly. Photo by André Karwath. Made available under the Creative Commons Attribution-Share Alike 2.5 Generic license. Cold-blooded animals cannot regulate their body temperature, so their cells are stressed when facing temperature extremes. Worse still, even at slightly colder temperatures, some biological processes in the cell are slowed down more than others, which should throw the cells’ delicate chemical balance out of whack. Yet, those cells manage to keep their biological processes coordinated. Now researchers from the University of Rochester and the European Molecular Biology Laboratory have found out how they do that. Welte and his team made their discovery while studying the internal mechanisms of the egg cell of the fruit fly, known as Drosophila. Welte explains that the production of certain proteins takes place along a type of assembly line that carries raw materials from the nucleus to the posterior end of the egg cell, where these proteins are then manufactured. When temperatures drop, the rate at which the proteins are built slows down significantly more than the rate at which the raw materials are delivered—something that has the potential of throwing off the entire operation. What keeps the assembly line functioning—based on the new research—is a protein called Klar. It does that by slowing down the rate at which the raw materials are delivered, to match the rate of protein building. The research findings were published today in The Journal of Cell Biology. The protein assembly line consists of microtubules that serve as train tracks on which the raw materials—including messenger RNA (mRNA)—are carried to the protein-making machinery, called ribosomes. It’s there that aprotein called “Oskar” is produced. The role of Oskar is to mark the posterior end of the cell so that thefuture embryo forms its tail in the right place. As temperatures decreased, Welte found that the protein-building process failed when Klar was removed from the egg cell. Only when Klar was present did the fruit fly develop properly. The research team included Yanxun Yu at the University of Rochester and Imre Gaspar and Anne Ephrussi at the European Molecular Biology Laboratory. Funding was provided by the National Institute of General Medical Sciences (NIGMS), which is part of the National Institutes of Health.